I was super excited over the summer when they announced the new S.T.E.M badges. We have been trying to incorporate more S.T.E.M activities in our home for the girls. Last year we got the girls the Dash robot for Christmas and they seem to genuinely have an interest in the programming fun. When the requirements for the badges came out, I have to admit, I was a bit confused. I must have reviewed the Volunteer Toolkit way too many times and then I realized, like with most of the resources offered, they always seem to be lacking creativity and visual explanation. So, I took to trusty Pinterest to assist with my research and planning. 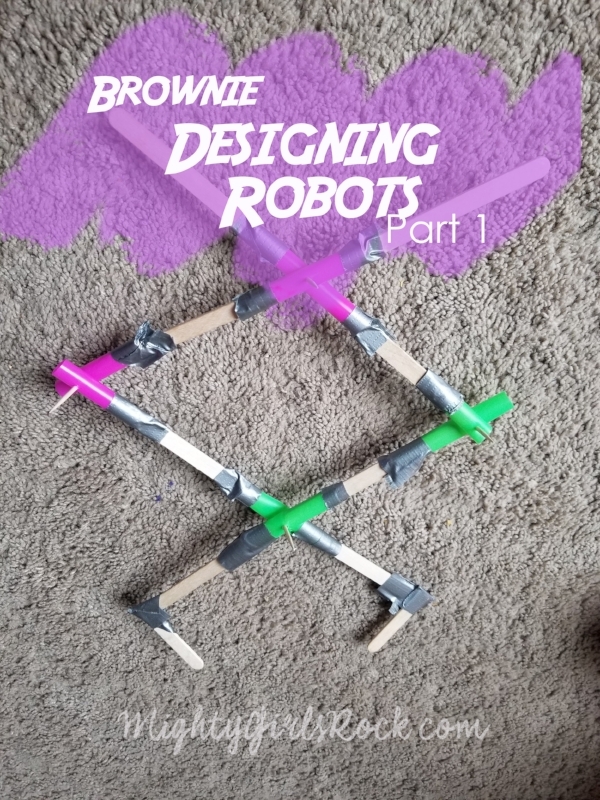 Here is Part 1 of the Designing Robots Brownie Badge. I do recommend doing this in 2 meetings. It's A LOT and not a badge I would try to cram into one session. They won't take away much if you rush it and that defeats the purpose, right? For this step, the girls partnered up. Each pair got a marker and a sheet of blank paper. One partner was given an example and they had to pose like a robot. The other partner had to draw what a robot would look like in that pose. Example of a pose: Robot playing basketball. Each person was given a chance to pose and draw/ We discussed the different examples of robotic parts they used in their drawings.... joints, gears, levers, pulleys, wheels, sensors, etc. The girls went on to build their own robotic arms to further explore how robots are like humans and biomimicry. They built arms that could both extend and grab an object. We lightly taped white lunch bags (filled with little prizes) to the wall for our mystery bag challenge! We taped them slightly above the girl's reach. To my surprise, the extender arms worked (for most)!!! This activity was a suggestion from the VTK. I liked the idea of building the robotic arms but their explanations and materials list left me so confused. There was no direction or suggestions on how to build, just a list of materials to let the girls explore. Now, I know we want to keep it Girl led but my girls could play with a box of the supplies all day and still be confused. So I needed to create an example for them. So this prototype took ME about 10 minutes to make which means the girls needed a solid 30 minutes to do it themselves. 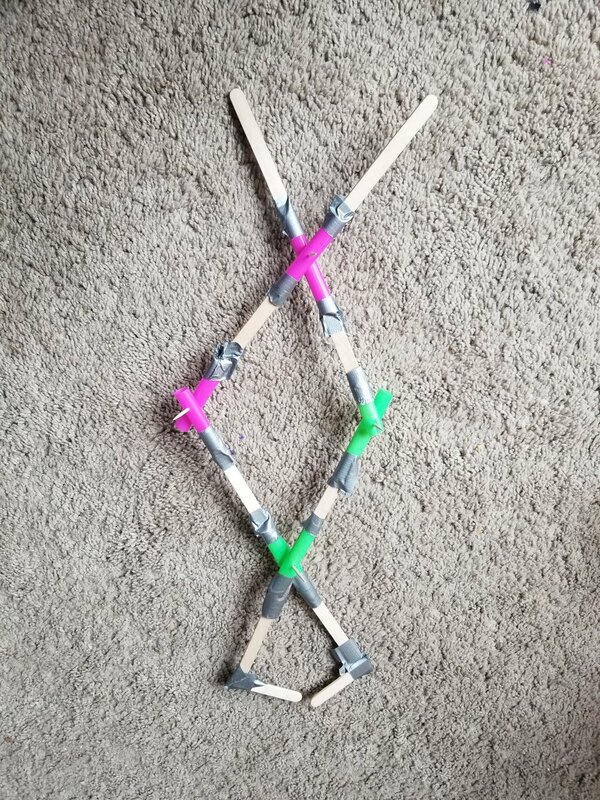 You will need two craft sticks, two 2 inch pieces of straw, and duct tape. Insert the end of a craft stick into the straw piece slightly less than halfway. Insert the other craft stick into the opposite end of the same straw piece. Leave a gap between the two craft sticks to allow for a toothpick hole. 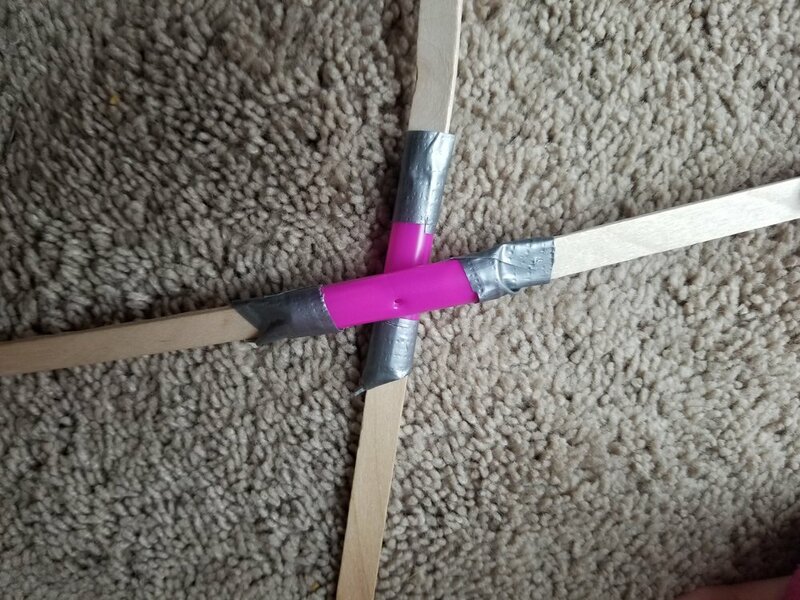 Secure craft sticks and straw bits with tape. Take your other straw bit and insert it into the open end of one of your craft sticks just short of halfway. Again, leave just enough room for a toothpick hole and secure with tape. Do this 4 times. Create your joint by taking one of your sections and punching your toothpick through the center of your straw piece. Take the second section and punch a hole with the same toothpick from your first section to overlap the two sections to make an X. 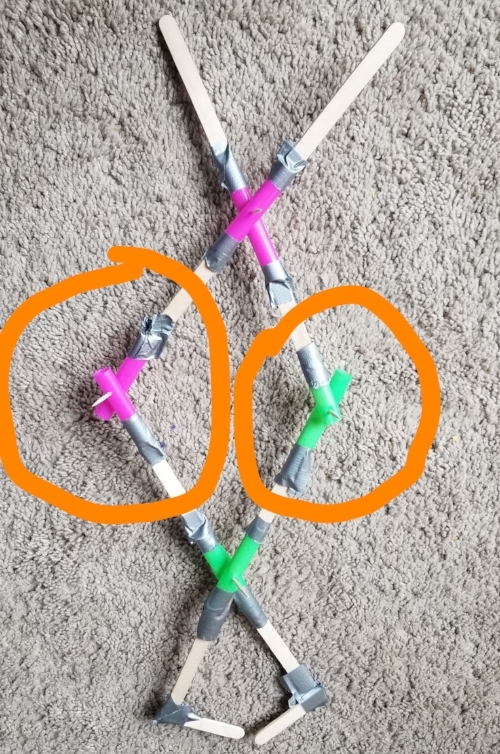 Take your two remaining sections that you have not used yet and attach them to the opposite straws bit (circled in picture below) using the toothpick punching method. You will want to create something that resembles pinching/fingers. 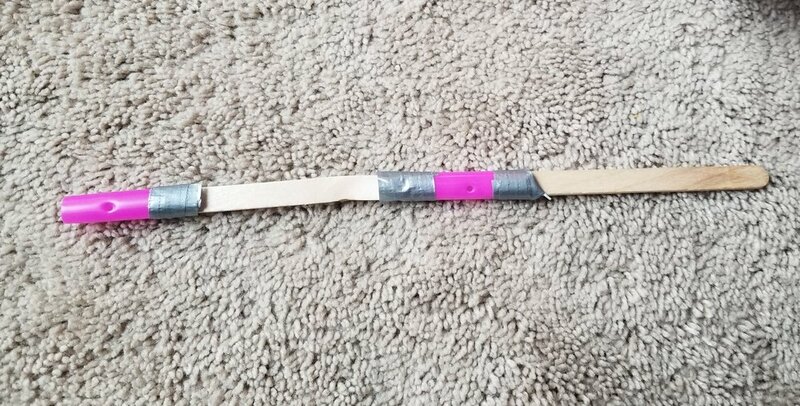 I cut a craft stick in half and attached each half to the end of an open end craft stick with tape (see the bottom half of the picture above). The extender grabber is now finished and at this point, you can have your girls test it out and troubleshoot areas for improvement. They might need more stability(tape) in an area. Have them play around with the arm and try the mystery bag challenge! Once the girls understood the different parts of a robot and how they can make one actually work, they got to brainstorming ideas for their own prototype. We discussed simple projects or tasks that would be helpful to have a robot do. We decided to do the tub scrubbing robot. We found a helpful video online and the girls planned out the materials they would need. Next meeting the girls will have an opportunity to make the robots! This concludes part 1 of our Designing Robots badge. Here you can find part 2 of the badge with our scrub bots!!! Don't forget to comment below and share what your troop did for the designing robots badge!! Posted on December 30, 2017 by Katie D. and filed under Education, Girl scouts and tagged girl scouts Brownie badges badge earning robotics STEM designing robots brownie stem.